Or BUY NOW with 4 interest-free fortnightly payments of $19.99 . The Reel Colors Power Handles are a game changer. 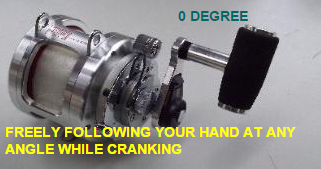 They eliminate "Flip-Flop" or "Rod Torque" including hand, wrist and forearm stress when cranking. This reduces pain through your wrist, hand and arm enabling you to stay in control of the fish and continue the fight. What is "Flip-Flop" or "Rod Torque"? "Flip-Flop" or "Rod Torque" refers to the constantly changing angle of your hand, wrist and arm when cranking The purpose of Reel Colors handles is to eliminate rod torque which in turn reduces pain and fatigue in your wrist, hand and arm. The power handle is free floating and pivots on bearings through +30 degrees to -30 degrees as shown below. The handle is covered in the highest quality Ethylene vinyl acetate (EVA) for superior comfort. With over 7,000 Power Handles sold worldwide Reel Colors is the best-kept secret in the game fishing community. Please Note: The Reel Colors Power Handles are fishing reel specific. 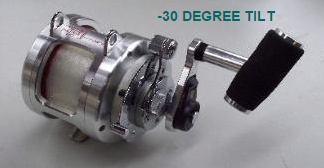 You must ensure the correct model Power Handle is chosen to suit the make and model of your fishing reel. Please refer to the Specifications tab. 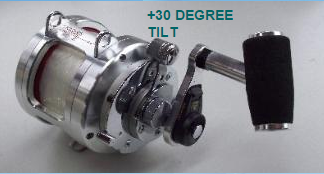 Eliminates "Flip-Flop" or "Rod Torque"
The Reel Colors Power Handle #9 is compatible with the following fishing reels.